The mainstay of breast cancer treatment is surgery when the tumor is localized, followed by chemotherapy (when indicated), radiotherapy and adjuvant hormonal therapy for ER positive tumours (with tamoxifen or an aromatase inhibitor). Management of breast cancer is undertaken by a multidisciplinary team based on national and international guidelines. Depending on clinical criteria (age, type of cancer, size, metastasis) patients are roughly divided to high risk and low risk cases, with each risk category following different rules for therapy. Treatment possibilities include radiation therapy, chemotherapy, hormone therapy, and immune therapy. Excised breast tissue showing a stellate, pale area of cancer measuring 2 cm across. The tumor could be felt as a hard, mobile lump before the surgical excision. Depending on the staging and type of the tumor, just a lumpectomy (removal of the lump only) may be all that is necessary, or removal of larger amounts of breast tissue may be necessary. Surgical removal of the entire breast is called mastectomy. Lumpectomy techniques are increasingly utilized for breast-conservation cancer surgery. Studies indicate that for patients with a single tumor smaller than 4cm, lumpectomy may be as effective as a mastectomy. Prior to a lumpectomy, a needle-localization of the lesion with placement of a guidewire may be performed, sometimes by a radiologist if the area being removed was detected by mammography or ultrasound, and sometimes by the surgeon if the lesion can be directly palpated. Recently live tissue samples from surgery are tested with various chemotherapy agents to derive probabilities of which ones may work better and specially the ones which would not work (Cell-death assays). The companies need the sample within 24 hours of surgical excision. This is specially useful for early stage cancers were a response for the therapy cannot be determined once the whole cancer is taken out during the surgery and the chemotherapy is given in an adjuciant setting. However, the benefits of such tests have not yet been established in clinical trials and is not mainstream. Radiation therapy is an adjuvant treatment for most women who have undergone lumpectomy and for some women who have mastectomy surgery. In these cases the purpose of radiation is to reduce the chance that the cancer will recur. 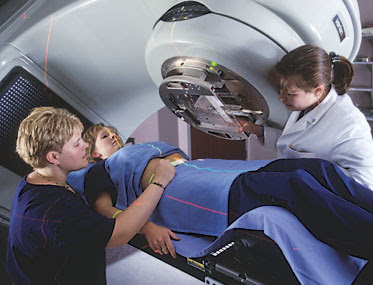 Radiation therapy involves using high-energy X-rays or gamma rays that target a tumor or post surgery tumor site. This radiation is very effective in killing cancer cells that may remain after surgery or recur where the tumor was removed. Radiation therapy can be delivered by either external beam radiotherapy or brachytherapy (internal radiotherapy). In the case of external beam radiotherapy, X-rays are delivered from outside the body by a machine called a Linear Accelerator or Linac. In contrast, brachytherapy involves the precise placement of radiation source(s) directly at the treatment site. Radiation therapy for breast cancer is usually performed after surgery and is an integral component of breast-conserving therapy.